In large skillet, brown ground beef; drain. Add water, 1 of the soup mix seasoning packets, stir-fry sauce and frozen vegetables; mix well. (Discard remaining seasoning packet or save for another use.) Bring to a boil. Reduce heat to medium-low; cover and cook 5 minutes or until vegetables are tender, stirring occasionally. 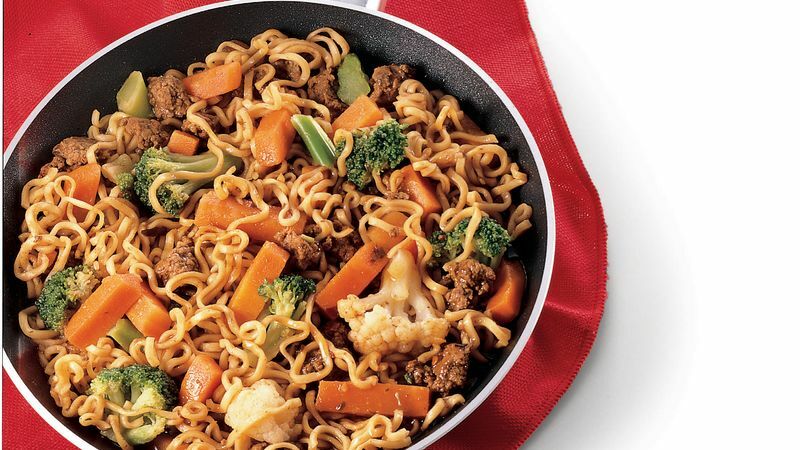 Break up ramen noodles; add to skillet. Cover; cook 5 to 8 minutes or until sauce is of desired consistency, stirring occasionally and separating noodles as they soften.